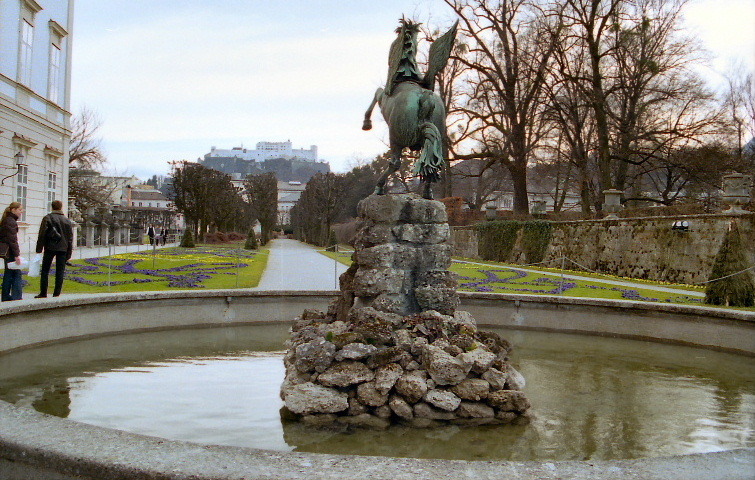 Here again is one of the opening shots from The Sound of Music, a reverse of the screen shot of the previous page (above). Off in the distance, to the viewer's upper left, is the shore of St. Gilgen, the spot from which I'd shot the panoramic photo of the previous page. 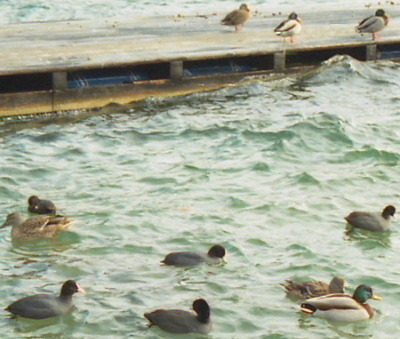 And here are some more mole hens on the shore of St. Gilgen. 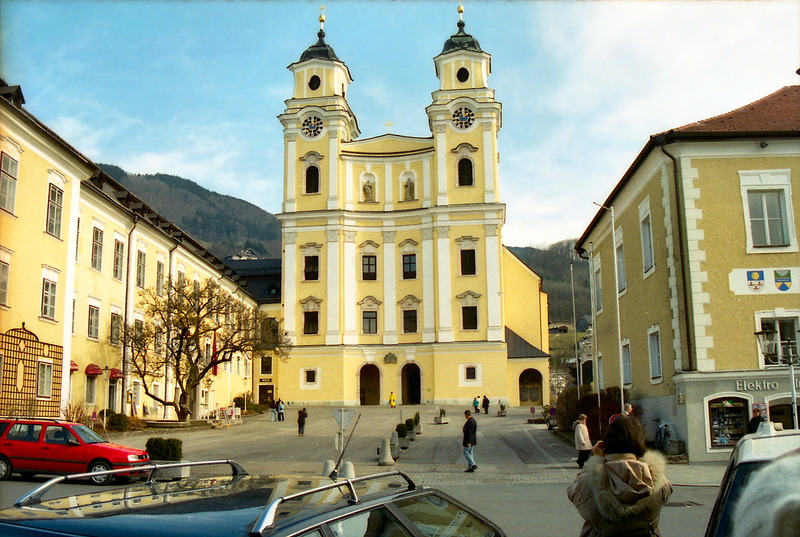 From there we drove over to Mondsee and St. Michaels, the church where the Sound of Music wedding was filmed. On the way through the mountains, that funny tour guide played the soundtrack for a singalong. Hearing this brought me back to my childhood when my father and Uncle Lawrence who'd just passed away, played that record in the basement of our house. I missed them both. I had no more male role models in my life. This was a very lonely trip, but I welcomed the loneliness if the only alternative was to sit in German bars with coworkers and drink my face off with people who ignored me. Besides, this was more interesting. They have beer in the U.S., even German. The older women tried to sing to the soundtrack, but once it came on, I realized how dorky I'd feel singing to it or even hearing it, as if a soundtrack could add anything to this gorgeous country. I was in a bus of European nerds. I think most of the tourists were of the same mind, because the ones who did sing, sang low and then mumbled a little bit and stopped. 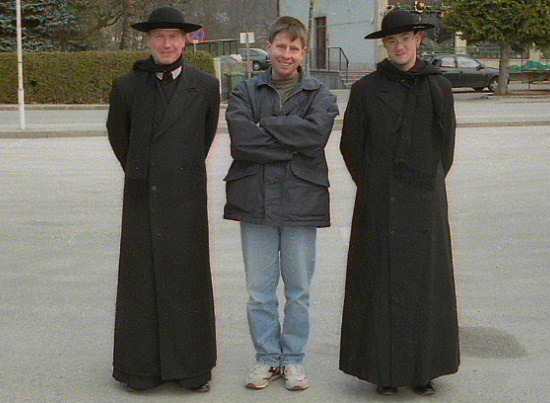 During the tour I befriended some British men, Rupert and Julian, who were studying to become Catholic priests in Rome. We spoke often, and Julian invited me to Rome to visit his church. I didn’t think I’d have time when I went there but I really wish I could've said yes. 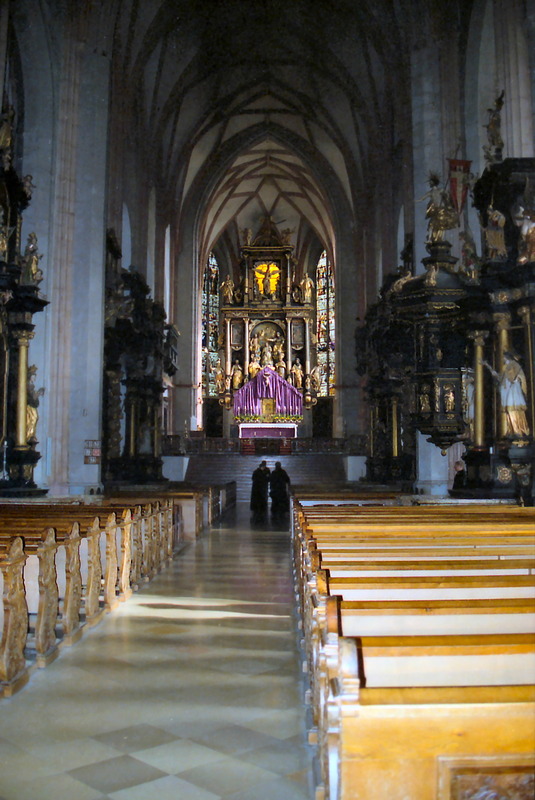 He said he’d pray that I come back to the Catholic Church. To the right is 5846 foot Schafbg, with a motel perched perilously on its summit--the guide said that was where Maria taught the children to sing in the film. 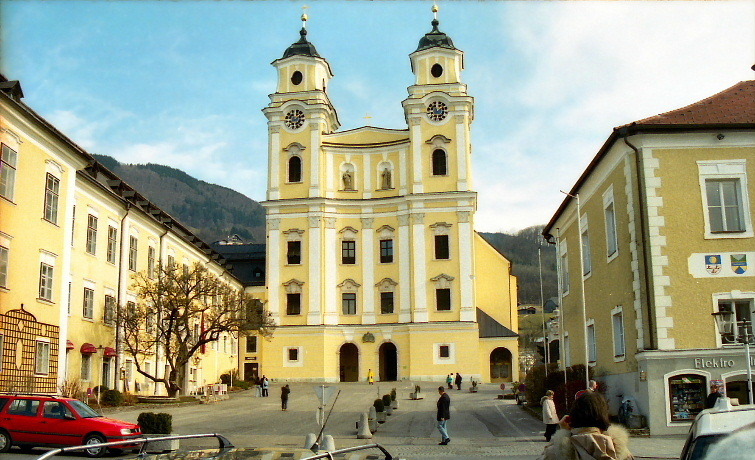 The original plan was to film the grand wedding of George Von Trapp and Maria Kutschera in St. Peters Church in Salzburg, but the crew didn’t ask permission before they hung Nazi flags for the film and Salzburg was so angry they threw them out, and so they had to take their crew to Mondsee. After dining on Mrs. Braun’s famous Apple Strudel, allegedly some of the best in the world, I entered St. Michaels. 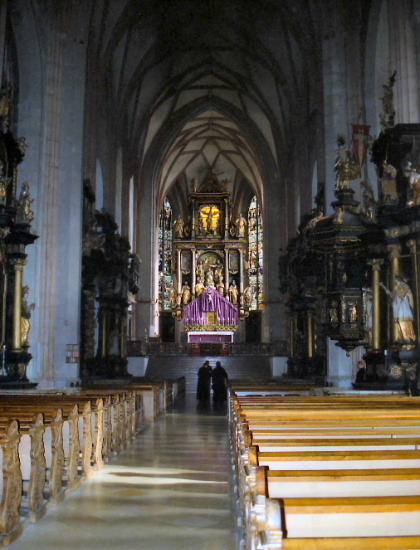 It was one of the plainest churches I'd seen in in Europe, on the outside, but inside it was very different. 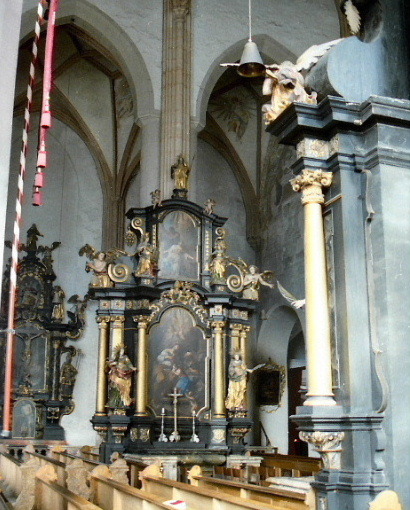 Next to Trier, it had the most beautiful, ornate interior I’d seen. 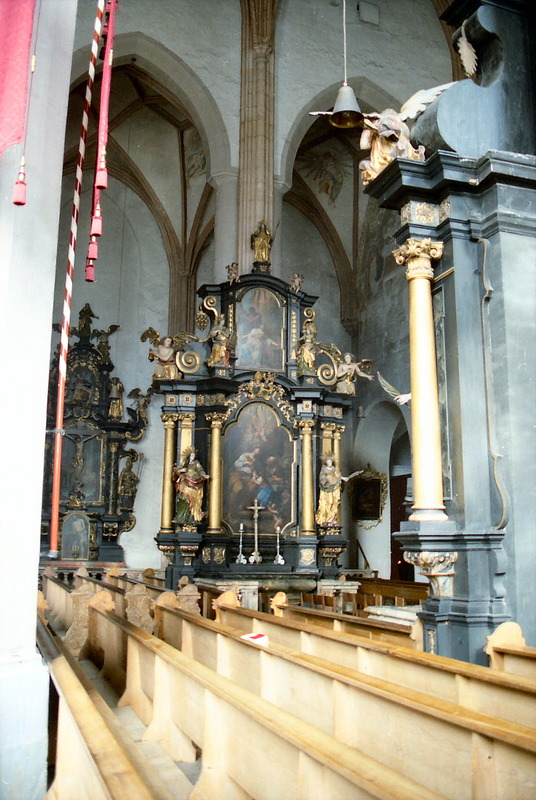 There’s a good reason for this--I later read that the same dude responsible for doing the art work in Trier came to Mondsee to work on St. Michaels as well. Here's a screen shot from the movie. This is not the cast of extras from March of the Penguins waiting for their queue, but the scene where Maria is let out of nun prison into the real world, and all her cellmates watch her marry the rich and powerful war hero, George Von Trapp, who shortly thereafter lost his fortune, but not before she adds a few more mouths to feed to his seven children. Suddenly prison life doesn't seem all that bad. 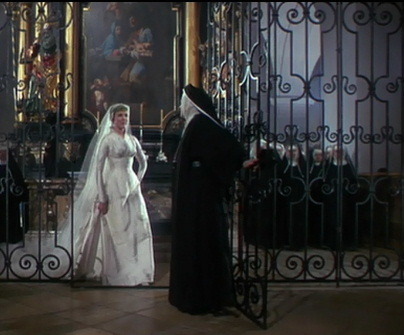 In my opinion, the biggest head-scratcher of the film is the grand and beautiful prologue played as Maria marches down the aisle, and then on her wedding day no less, the nun prisoners begin to sing "How Do You Solve a Problem Like Maria?". In all their planning, didn't the screenwriters find this odd, almost ridiculous? Imagine if they'd sang "Maria is Fat", "Maria has Gonorrhea", or "Von Trapp is Full of Crap"? But no, the teasing from the nuns continues, even after Maria is paroled. I'm almost surprised her nun mates didn't play a practical joke on her, like tying her ridiculously long train to the bars at the back of the church and watching her do a "Nun running against the wind" mime. Shortly after is one of the most boring scenes of the film, when Liesl asks her new mother what to do now that Rolf has dumped her for the Nazis, and they repeat another song that doesn't deserve repeating, "Sixteen Going on Seventeen", or as I like to call it "Nodding, going on Sleeping". Why didn't they just unload a few tons of laughing gas on the audience and let them take a power nap instead? 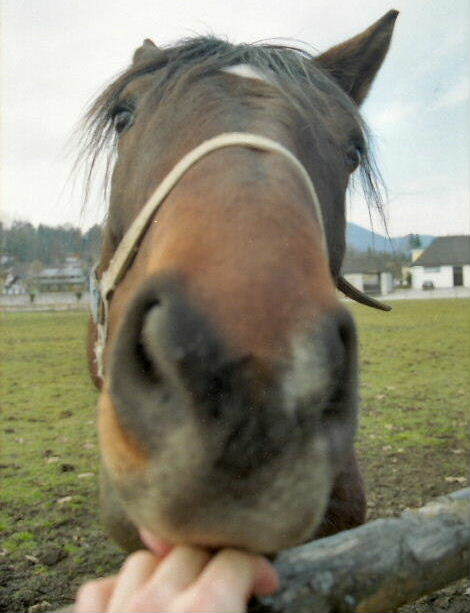 I played with some Austrian horses and before we departed, the tour guide told a Sound of Music joke: The Hill family is on vacation when, in the middle of the stormy night, their car breaks down. They can’t get help so they decide to go to the top of a hill to a creepy house and ask for help. Dracula answers the door. He says he doesn’t know anything about cars but they were welcome to stay the night. They graciously accept. During the night Dracula goes around and bites them all in the neck, drinking their blood and killing them. In the morning he feels very energetic--he hasn’t had that much blood in a while. So he sits down and starts playing some music on his big piano. The next thing he knows, the Hill family are standing behind him. He asks,”What are you doing here? 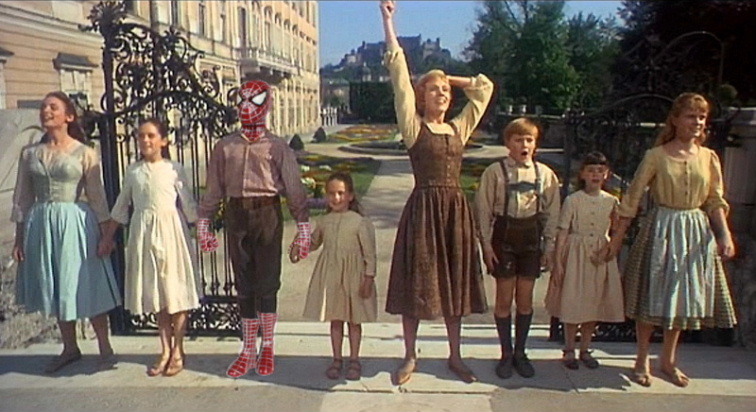 I thought I killed you?” and the father says,”The Hills are alive with the sound of music”. Badump! It was fun, and I met some new friends there too (to the right, Julian and Rupert). After seeing this small portion of Austria, I realize that the real star of The Sound of Music was Austria itself. 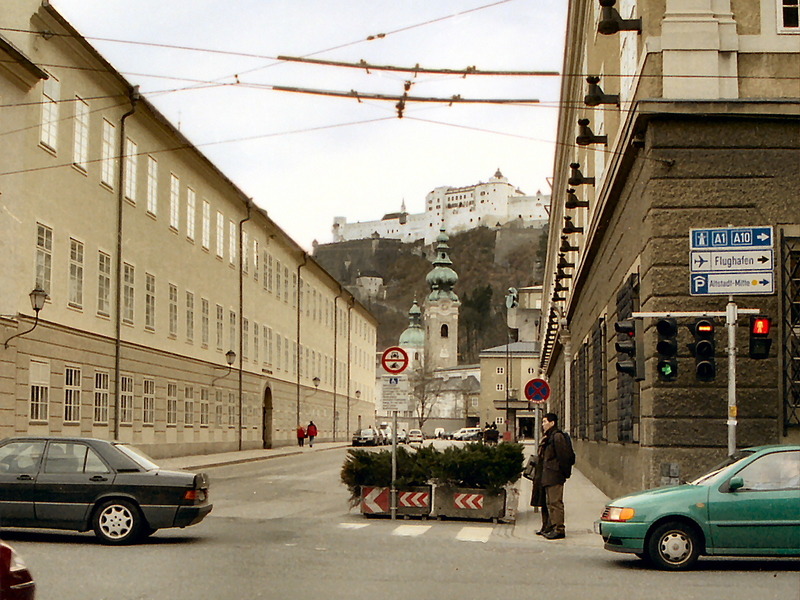 You can't visit and not feel that had that film not been set in Austria, it would've been less. It also helps you understand the characters better. George Von Trapp was intensely loyal to Austria, and the Anschluss (Nazi takeover of Austria) took what was his life, the other part having been lost when his beloved first wife Agathe died of scarlet fever in 1922. 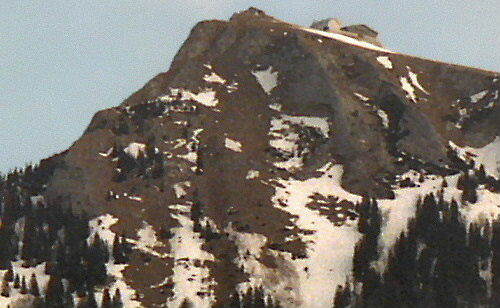 Edelweiss, my favorite song in the film, is not an Austrian Folk song, but was written for the film. Edelweiss was a tiny white flower that only grew up in the mountains, in a cold, dry climate with bright sunlight (I still have some edelweiss seeds but have yet to find how to replicate that climate). The tradition was that a man would prove his love for his lady by climbing into the mountains and picking edelweiss for her. I assume the peaks and valleys of the mountains are littered with the bodies of well-meaning young men, and overzealous drunk old men, but I can't prove it. 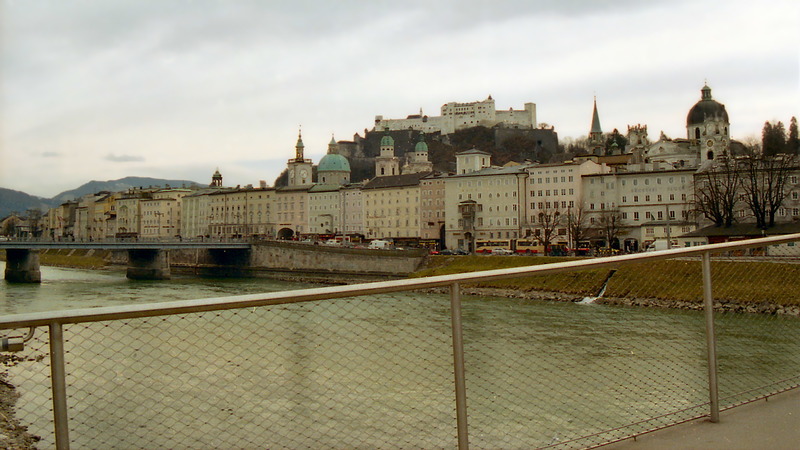 Seeing Austria and knowing a few things about the country add color to this story. 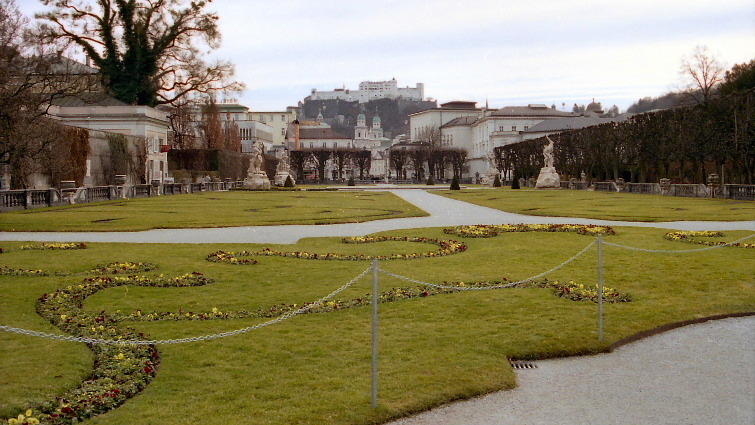 I would've loved to stay in Austria longer, but I was on a tight schedule and couldn't hang around to see more places where Maria supposedly slept, ate, sang, etc...I was shown by the Tickler how to get back to my hotel on foot, and within 30 minutes I had run through Mirabell gardens. 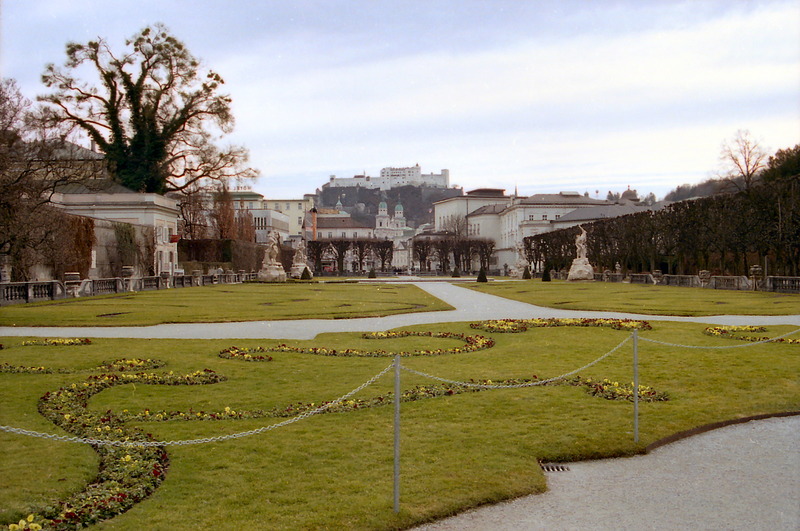 Below is another screen shot from The Sound of Music with Maria and the children in the gardens singing "Do, Ray, Me, blah, blah, blah, blah" when Maria teaches the children to sing and express themselves. It appears the censors may have taken care of Maria's hand. 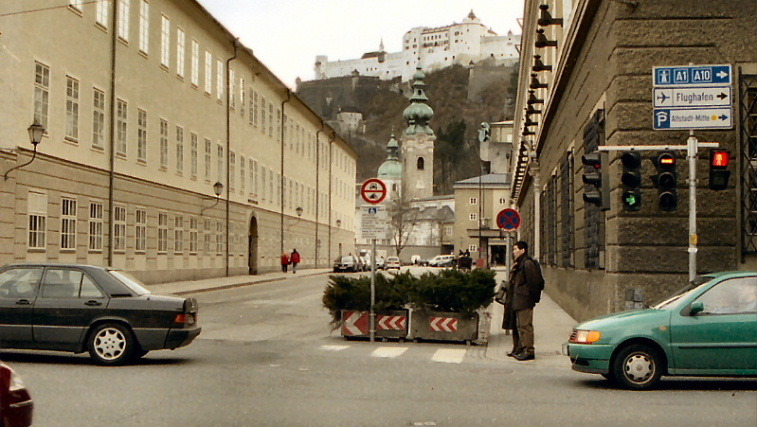 I ran through that tunnel, picked up my Passat, and just before I shot out of Salzburg, I parked and shot the bottom photo. 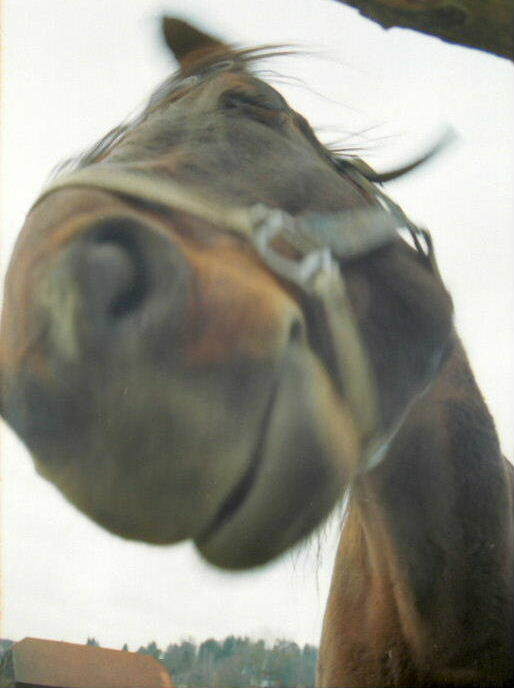 At the time I was in front of a horse shrine which looked interesting, but I was short on film. I later found the scene below (another screen shot from the movie) where Maria and the seven dwarves ran in front of that same shrine. I was parked right where this scene was shot, approximately on top of Maria's head. Had Maria and the children ran another 50 feet, and gone right, they would've come out of the other side of a tunnel and been looking at Hotel Neutor. I never really got into the Mozart Birthplace thing (Mozart was born in Salzburg) because I didn't have time. Last night it took 1 1/2 hours just to drive from Mirabellplatz to my hotel. Now I ran it, with detours, got in my car, and was out of the country in under 30 minutes. It’s amazing what sunlight will do for you.